To represent our most recent archive acquisition, from 2009, I have chosen this wonderful costume design by Anne Estelle Rice from our collection, TGA 200920. 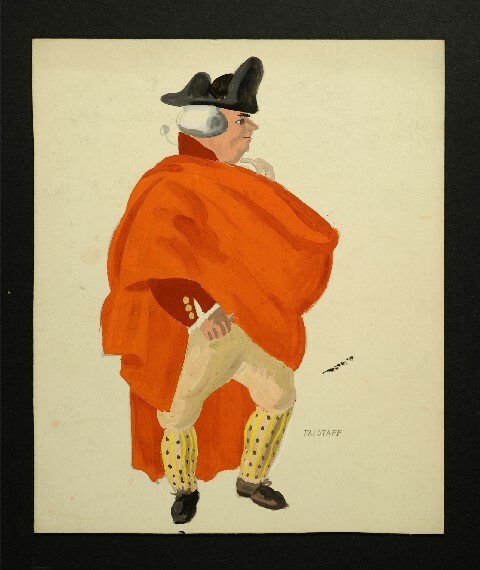 The design is for the character Falstaff, from William Shakespeare’s, Henry IV parts I and II, and The Merry Wives of Windsor. I decided upon this particular costume design, not only as Falstaff is a favourite character of mine, but also because this piece combines Rice’s skill as an illustrator with her passion for theatre. Anne Estelle Rice was born in Pennsylvania in 1877. In 1884 she enrolled in the School of Industrial Art of the Pennsylvania Museum where she studied for three years before taking sculpture and life drawing classes at the Pennsylvania Academy of Fine Arts. Initially Rice was sent to Paris by the Philadelphian publication, North American, to illustrate the latest fashions and it was during on of these trips that she met the Scottish painter John Fergusson, who encouraged her to become a painter. Rice would later move to set up home in Britain in the 1910’s having married the English art and theatre critic, Raymond Drey in 1913. Primarily an artist, Rice had an interesting and varied career working as an illustrator for American and British publications, such as Colliers, Harpers, and Rhythm, as well as designing sets and costumes for numerous operas and dramas during the 1930s. TGA 200920 boasts a fascinating collection of costumes and set designs for various theatrical productions such as Othello, Macbeth, and A Twelfth Night. These are beautifully designed, and display both Rice’s love of the theatre and her talents as a gifted draughtsman. TGA 200920 also includes early sketchbooks by Rice, correspondence, writings, personal documentation, printed material and exhibition catalogues. Having recently been to see Henry IV parts I and II, Rice’s beautiful portrayal of Shakespeare’s comic character, Sir John Falstaff, reminded me of how much I enjoyed these plays. Have you been to see anything interesting at the theatre recently, and were you impressed by the costumes and stage designs?